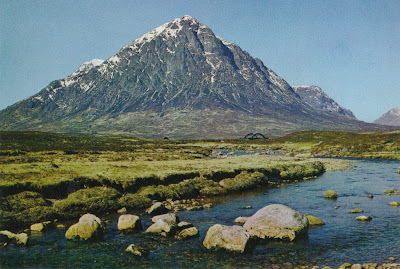 This 1969 postcard of the impressive Buchaille Etive Mor is in Scotland. This view is from the bridge over the River Etive on the Rannoch Moor Road. I remember a spectacular train ride through Rannock Moor - about thirty years ago. We stopped at a platform with no buildings around. A few walkers got off to join the sheep, and as the train carried on I gazed out over many many miles of peaty moorland, heather, and darkening clouds, with a feeling of apprehension... Soon I would have to leave the cosy train and try to find somewhere to sleep for the night. The near horizontal rain meant that I would not be camping. I think I ended up in Inverness Youth Hostel.